So last post I said I was continuing the River Knife series of modules, and here I am, flogging the second installment! Evil Wizards in a Cave is a sandbox adventure module for the Dungeon World and Labyrinth Lord fantasy role-playing games. The Tellurine Monastery has a serious problem—a band of evil wizards have stolen their holiest relic, the helmet of Saint Anglard, and fled. The abbot believes they are hiding out in one of the region’s many caves, judging by the recent increase in weird occurrences. But can he find a group of adventurous mercenaries who won’t be distracted? This sandbox adventure offers more than just a quest! Dragons prowl the valley, a beastman is on the loose, and there are tales of a haunted house up in the mountains somewhere, full of treasure. What sort of trouble will you get up to here? Those evil wizards? In caves. Plus some other surprises buried throughout the hex map: Wandering monsters, treasures, a haunted house, and other secrets all over. Evil Wizards in a Cave can be used as a sequel to RK1: Knives in the Dark, as the PCs make their way down the River Knife, it can be used in conjunction with other adventures and dungeons, or it can stand on its own just fine. All you need is an actual role-playing game in order to play it. 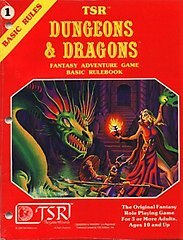 Obviously, I recommend Labyrinth Lord if you’re from the old school and Dungeon World if you’re a dirty hippie storygamer. Read a REVIEW by Jeremy Friesen of Take On Rules. Read a REVIEW by Paul Baldowski of Geek Native. 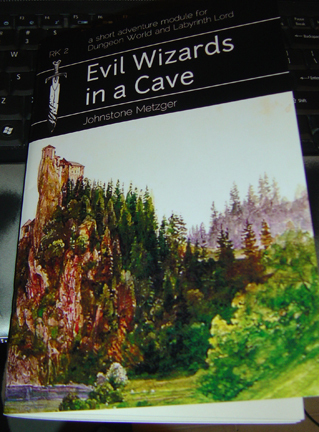 Evil Wizards in a Cave is available from DriveThruRPG in pdf for US$5, and a print version is forthcoming. Evil Wizards in a Cave is also available from Lulu, as a softcover, staple-bound booklet in B&W with creme-coloured pages, for US$12.